Conceived in 1953 and cast in an edition of 6. The present work is recorded in the Hillman/Adams Catalogue Raisonné as 1954/13 and Opus 15. A. Grieve, The Sculpture of Robert Adams, London, 1992, p. 168, no. 157, another cast illustrated. A cast from this edition is in the collection at the University of Michigan Museum of Art. 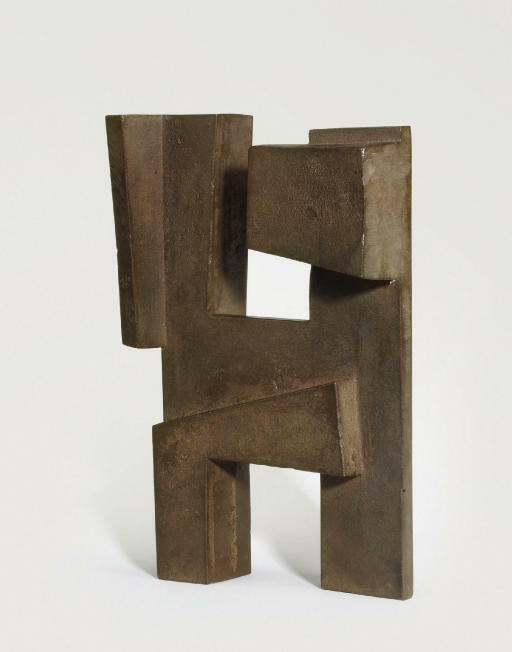 Robert Adams worked on a similar piece called Rectangular bronze form No. 1 in the same year, a cast of which is also owned by the University of Michigan Museum of Art in the Marvin Felheim Collection. Please note that the correct title for this work is Rectangular bronze form No. 6 and was conceived in 1955, not as stated in the catalogue entry. The work is recorded in the Hillman Adams Catalogue Raisonné as 1955/17 and Opus 30, and is no. 182 in The Sculpture of Robert Adams by A. Grieve.